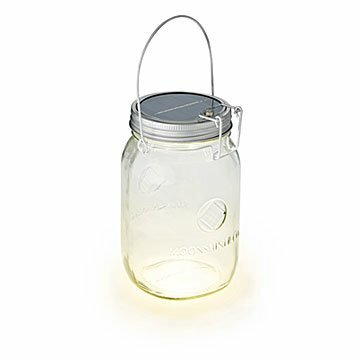 Topped with solar panels, this jar creates 12 hours of convenient, cord-free, clean-energy lighting. Mason jars are taking over the universe—hurray! They've ruled over canning and pickling forever, staked their claim on smoothies and cocktails, and now, with this solar powered design, harnessed the power of the sun. Topped with efficient solar panels, this jar contains the power to create 12 hours of convenient, cord-free, clean-energy lighting, homey ambiance, portability, even artistry: Fill them with handfuls of seashells, colored glass or confetti to spiff up any space. Or keep them handy to add just the right amount of light to evening strolls, post-dinner porch conversations, and parties under the stars. Not for use with food or liquid. Avoid leaving in the rain. Offers 12 hours of light when completely charged. Coolest for seashells and light stays on for a long time. One of the favorite gifts at the Yankee Swap! This is a very attractive and useful product. It will really come in handy for my friend who got this at our Christmas Yankee Swap party because she likes camping and it will really come in handy. I bought this product as hostess gifts. Was bright, easy to operate and needs only the Sun! Purchased as a gift and she loved it! In style product. They loved it!